This week's song is Charlie Kane performed by Harry A. Bailey and a bevy of chorus girls in Citizen Kane (1941). Composer Bernard Hermann wrote the score for Citizen Kane, but the song used in the Charlie Kane number is actually a Mexican folk song that was adapted for the film. Citizen Kane, one of the greatest of all American films, tells the story of the rise and fall of newspaper magnate Charles Foster Kane (Orson Welles). 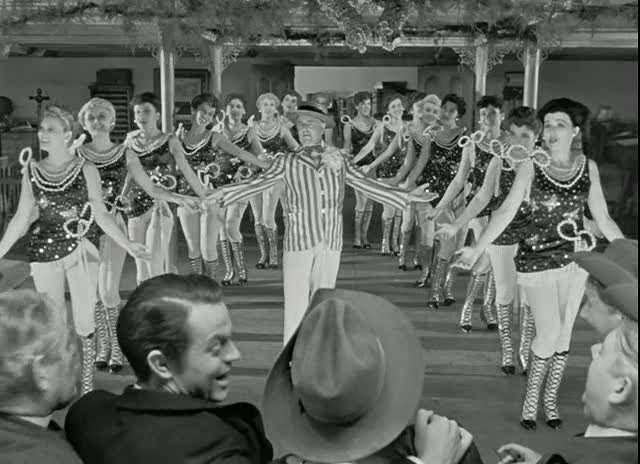 The Charlie Kane number takes place early in the film. A youthful Kane and his friends and employees Jedediah Leland (Joseph Cotten) and Mr. Bernstein (Everett Sloane) are celebrating the success of their newspaper, The New York Daily Inquirer, with a typical turn-of-the-century stag party featuring cigars, chorus girls, and plenty of talk about politics. In fact, Kane's comments about declaring war on Spain are references to the 1898 Spanish-American War, which was heavily promoted by newspapers at the time. Character actor Harry A. Bailey and a bevy of chorus girls perform Charlie Kane in Citizen Kane (1941). The ever prolific Welles, who also co-wrote the script and directed the film, wanted to use as many film styles as he could in Citizen Kane, so he inserted a musical number in the party scene. Welles had picked up the tune to a popular Mexican folk song, "A Poco No", while on vacation there. "A Poco No" was written by legendary songwriter Pepe Guizar, called the musical painter of Mexico for his songs that combined traditional folk music with classical elements. Internationally, Guizar's best-known song is "Guadalajara," but "A Poco No," a lively mariachi number about a man who asks his lady love for more than a little kiss, is still quite popular in Mexico today. The clip below shows Mexican singer and actress Esperanza Iris singing "A Poco No" in the 1938 film, Noches de Gloria. Welles decided "A Poco No" would be the perfect tune for a vaudeville style number, so Herman Ruby, an RKO songwriter who worked on Fred Astaire and Ginger Rogers films, wrote alternate lyrics that celebrated the glories of Charles Foster Kane (sample lyrics, "for the poor you may be sure that he'll do all he can"). The Charlie Kane number is my favorite scene in Citizen Kane, mostly because Welles is having such a great time. He's certainly in character as the bombastic Kane, but Welles, who loved to be the ham at every picnic, was clearly having a wonderful time performing a soft-shoe routine. 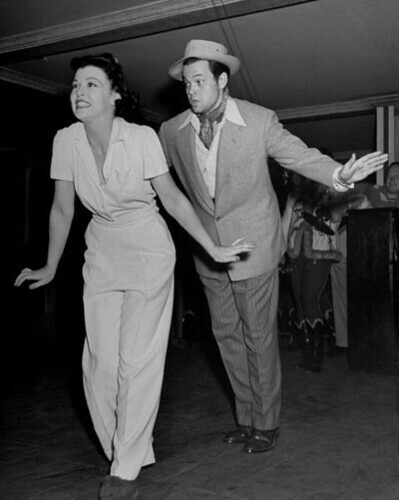 Dancer Suzanne Ridgeway and Orson Welles rehearsing the Charlie Kane number in Citizen Kane (1941). The animated television show, The Simpsons, parodied Citizen Kane in a season five episode, Rosebud, that had an embittered Mr. Burns searching for his childhood Teddy bear. The episode included a version of Charlie Kane with new lyrics, but I couldn't find that online because of copyrights.